A dad headbutted his former partner and shoved her down a flight of stairs in front of the couple’s three children. 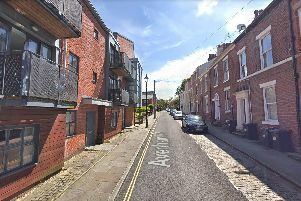 Kyle Hayes admitted to pushing Lyndsey Hayes down the steps although it was argued that their heads had made contact as a result of the altercation and was not deliberate or with enough force to cause injury. But the 38-year-old of Wardley Square, Tyldesley, pleaded guilty to the assault and to pushing Mrs Hayes’s friend Kate McKerman when she tried to intervene in the clash. Prosecuting at Wigan and Leigh Magistrates’s Court, Tess Kenyon said: “Mrs Hayes had been in a relationship with the defendant for 11 years but they split up seven years ago and have three children together. “The two younger children were at Mr Hayes’s flat when one phoned their mum saying the wanted to go home. “The child seemed upset so Mrs Hayes got in a taxi with her eldest child and her friend. “When they arrived outside the defendant’s flat, they could hear one of the children shouting. “She entered through the communal door and walked up the stairs to try and get her daughter who was stood at the top. “My Hayes stood between them and headbutted her, causing her to fall down the stairs. “She grabbed the rail to stop herself but he pushed her and fell on top of her at the bottom of the stairs. “She was left with swelling and bruising to her ankle and knee and struggling to walk as a result. The court heard that Hayes had previously denied the two assault charges but subsequently changed his plea to guilty. Karen Schofield, defending, said: “What is clear is that Mr Hayes was at his flat when there was some upset between his children, they contacted their mother and she came to collect them. “Mr Hayes said that it was immediately apparent to him that they had been drinking and he wasn’t happy about that. “There was an argument and a scuffle. “As she came up the stairs, he came out because he didn’t want to let her in. “Had he been more welcoming none of this would have happened. “In relation to the headbutt it was not with any degree of force because there would have been an injury but there was nothing on her face, not even a mark. “There was a meeting of heads but it was not a deliberate headbutt. “The injuries are not caused by him pushing her but as a consequence of his actions she goes over on her ankle and bangs her kneww on the way down. Hayes was sentenced to a 12-month community order involving the completion of 100 hours’ unpaid work and a 15 days’ rehabilitation activity requirement. He was ordered to pay £200 court costs, £150 in compensation to Mrs Hayes and £50 Ms McKerman plus a £60 victim surcharge. A restraining order was also granted, banning him from contacting Mrs Hayes for 12 months.